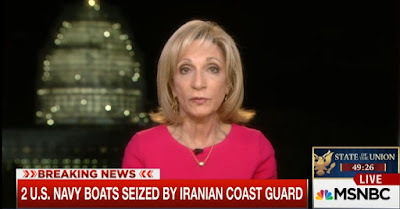 Wide Asleep in America: Andrea Mitchell Said British Sailors Were Held by Iran in 2007 for 'Months and Months.' That's Not True. Andrea Mitchell Said British Sailors Were Held by Iran in 2007 for 'Months and Months.' That's Not True. Appearing tonight on MSNBC in advance of Barack Obama's final State of the Union address, foreign correspondent Andrea Mitchell spoke to Rachel Maddow and Chris Matthews about Iran's seizure of two U.S. Navy riverine gunboats (and 10 crew members) that had entered Iranian territorial waters on their way from Bahrain to Kuwait - perhaps accidentally, perhaps due to a mechanical malfunction or engine failure, perhaps not. The timing of this event "could not be worse," Mitchell explained, noting that Obama was poised to laud the success of the multilateral nuclear deal negotiated and signed last year by Iran, the United States and five other world powers. Important terms of the deal - such as the lifting of international sanctions on Iran - are set to go into effect just a few days from now. As it turned out, Obama's speech was not rewritten to specifically address the naval issue. "The backdrop here is that years ago, 2007, British sailors were taken, they were not released for months and months." While the term "taken" is a highly suggestive one considering Iranian allegations that British navy vessels had entered Iranian waters in the Persian Gulf, Mitchell was referring to the March 23, 2007 incident when 15 members of the Royal Navy - eight sailors, seven marines - were taken in Iranian custody and subsequently transferred to a detention center in Tehran. Yes, similarities between the 2007 incident and today's are obvious. Immediate and incessant were the claims that Iran was engaged in outrageous, aggressive behavior, with the British sailors and marines, dubbed "hostages," said to have been "kidnapped" and "abducted." Such outrage, regardless of knowing the full facts of the situation, has once again been on display after news broke about today's incident (as if an Iranian patrol boat entering American territorial waters wouldn't be instantly either detained or attacked by the U.S. Coast Guard). But it is not true that the British personnel, as Mitchell said, "were not released for months and months." In fact, harrowing as their ordeal may have been, they were held in Iran for less than two weeks: from March 23 to April 4, 2007. That's a far cry from "months and months," yet nobody felt the need to fact-check the veteran reporter. In another incident from late 2009, five British nationals were traversing the Persian Gulf from Bahrain to Dubai in a 60-foot yacht in order to take part in an international boat race to Muscat when their propeller broke and they drifted into Iranian territory. They were picked up by an Iranian Navy patrol and held at a naval base on Sirri island for about a week before being released. At a press conference in Dubai afterwards, one of the sailors said their Iranian guards had been "excellent hosts" and that "the crew passed the time playing chess and darts and trying to keep each other's spirits up." "For the first few days the door was locked all the time, then gradually it was left open more often, till one evening one of the guards asked if we wanted to sit out on the patio and watch a football match on TV," he said said. "We were brought three meals a day, crisps and snacks. We always had a bowl of fresh fruit. If anything, we may be a bit overweight because they were feeding us so much. They discovered one of us liked Iran tea, so it arrived by the flask." "It was a bit like a camping trip, actually. It wasn't bad at all," he added. Reuters is reporting that both American and Iranian officials have affirmed the detained U.S. sailors are "safe and well-treated." White House spokesman Josh Earnest told the press, "We have received assurances from the Iranians that our sailors are safe and that they will be allowed to continue their journey promptly." Hopefully the current incident will be resolved quickly, especially due to the recently renewed direct channels of communication between senior diplomats of both nations. In the meantime, however, getting the facts straight and keeping hysteria at bay is important. Chances are this will all be over soon. January 13, 2016 - The American sailors have already been released. Yet hysteria about Iranian aggression and lazy, knee-jerk comparisons to hostage-taking are already ubiquitous. This morning, Glenn Greenwald at The Intercept points out how "the U.S. media instantly converted the invasion of Iranian waters by U.S. ships into an act of aggression by Iran" because of "the permanent narrative that any countries adverse to the U.S. are inherently evil and aggressive." But the media reaction last night is also explained by the fact that their self-assigned role in life is to instantly defend their government and demonize any governments that defy it. Even when the White House was saying it did not yet regard the Iranian conduct as an act of aggression, American journalists were insisting that it was. The U.S. does not officially have state TV; it has something much better and more effective: journalists who are nominally independent, legally free to say what they want, and voluntarily even more nationalistic and jingoistic and government-defending than U.S. government spokespeople themselves. January 15, 2016 - It turns out the Navy boats didn't suffer mechanical problems, but rather - the U.S. government tells us - "made a navigational error that mistakenly took them into Iranian territorial waters." Reasons why this may have happened are apparently being spit-balled: "A sailor may have punched the wrong coordinates into the GPS and they wound up off course. Or the crew members may have taken a shortcut into Iranian waters as they headed for the refueling ship, officials said," according to a report in The Los Angeles Times. Glenn Greenwald, who previously noted the media's uncritical parroting of official claims when news of this incident first broke on Tuesday, reminds us that "no matter how many times the U.S. government issues patently false statements about its military actions, those statements are entitled to unquestioning, uncritical treatment as Truth the next time a similar incident occurs."